Journalist Rilla Page Palmborg begins her autobiography of Greta Garbo from 1931, The Private Life of Greta Garbo, by mentioning her availability to the press, the importance of the title now almost lost on us in that by being the Hermit of Hollywood, as a recluse, all there was was the private life of the actress, other than her being an onscreen fictive creation. "During her romance with Jack Gilbert, Garbo did give a few interviews. But since Jack's marriage to Ina Claire she flatly refused to talk. The motion picture magazines have been desperate to get stories about her." At this time she was already Garbo, and had she been an alcoholic the study of feminism in the twentieth century might seem easier; reports of John Gilbert having drank heavily seemed to be spared until his early death may have necessitated them. "Greta Garbo talks on Love" was printed in the larger font in a small square advertisement placed in Screenland Magazine during 1931. In as much as Hollywood screenwriters may or may not have been influenced by the extratextural offscreen discourse of fan magazines while constructing their diegetic fantasy worlds, biographers later putting into the biography, mise-en-legend, rather than putting in the scene, mise-en-scene, the photo-caption read, "Would you like to know how the greatest siren of them all feels on the greatest subject in the world? The answer in Garbo's own words is in the August Silver Screen- this and fifteen other startling features." In its own way the announcement of a coming magazine attraction" in itself predates a discussion of genre, Greta Garbo by then having refined her image, and studio contract, from sexsymbol youth, to romantic actress, to soon to be costume drama leading lady. One biographer who encapsulated the spirit of the fan magazine was John Bainbridge, as difficult as it is to ascertain whether he was reluctant to divulge the identities of people whom he had personally spoken to, or whether he had a penchant for quickly taking notes from material that had been published twenty years earlier. As a companion to his biography on Greta Garbo Bainbridge published a three part condensed biography in Life Magazine printed in early 1955. The Ture Sjolander of 1971 began his photographic essay on Greta Garbo very differently than contemporary Richard Corliss, writing shortly thereafter, had began his. Sjolander very accurately writes, The stories, observations, descriptions, analyses and interpretations of Garbo are legends alone and contrast sharply with the lack of information from Garbo herself. Distorted by rumor, guess, error, or motive, the real Garbo remains silent and elusive...The truth about Garbo is in pictures." His biography of Greta Garbo follows her from her childhood home in Bickingatan, Stockholm to her third visit to Sweden in 1935 to later photos taken as the actress was living as a recluse, her briefly passing the camera and it allowing only a glimpse of her. His account includes mysterious excursions where Greta Garbo in between films travelled under the names Phyllis Smith, Beatrice Wille, Helene Morgan and Harriet Brown. While not publishing works of film cristicsm or history, Sjolander has in fact continued as a dynamic visual artist to the present. The private life of Greta Garbo much to the contrary, escapes the slightest scrutiny of Richard Corliss, the earliest acting done by Greta Gustafsson only intimated as biography by a still photograph from the film Peter and the Tramp. By his own admission, Corliss only writes about the films Greta Garbo appeared in, as one of us, her many spectators, and keeps in front of the screen as a moviegoer in a theater. Referred to as peerless by Time Magazine, Corliss nevertheless acknowledges writes of biography as acquaintances that were brought to him though the study of actress Greta Garbo among them being Ray Durgnant, Andrew Sarris and Molly Haskell, added to which are the names John Bainbridge, Kevin Brownlow, Pauline Kael and Norman Zierold that appear in his bibliography, which also attempts to add Parker Tyler, Georges Sadoul and Bosley Crowther. Nancy Gibbs, editor of Time Magazine reported the death of film critic Richard Corliss during the middle of 2015. These are the film's of Greta Garbo reviewed by Corliss, editor of Film Comment, for their value as films along with the interest in them and in the Greta Garbo that helped create them that was left unevaluated by the prolific film reviewer. To begin the year 2017, I finished a two day correspondence with biographer Eve Golden. It had been more than a decade since I received a letter from Leatrice Gilbert Fountain (I still call her Leatrice Joy Fountain), who at that time expressed her delight at being on the Internet at her age, so I was excited when something came to my mailbox concerning John Gilbert and Ruth Harriet Loiuse. Sadly, Ms. Golden wrote that she has forsaken biography for the moment, her writing "no more books for me" claiming that the expense of preparing a biography outweighs its production, but the author "highly recommended" the work of author Robert Dance and I promised to keep watch for anything new that Ms. Golden may be writing. 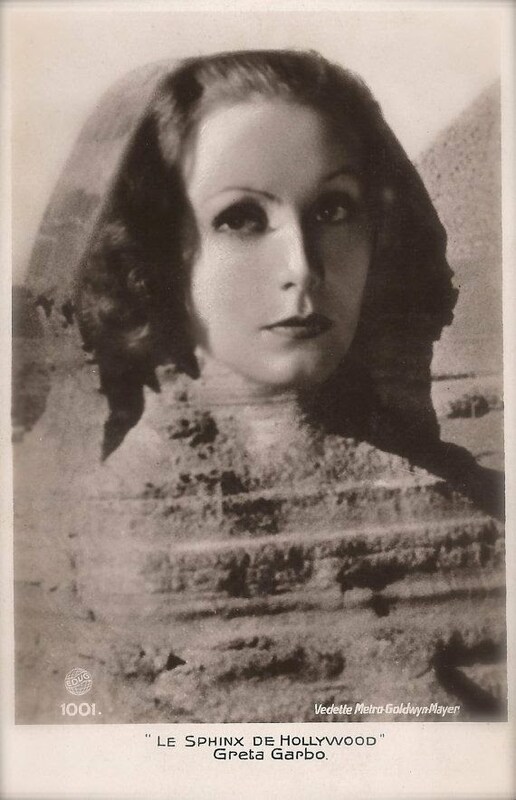 In the "First Interview She has Granted to any Magazine in Months", Greta Garbo in "The Swedish Sphinx Speaks" broke "her long silence" about when she would exit the silent film era, interviewed by Ralph Wheelwright in Screenland Magazine during 1929. "'I hated talking pictures when they first came out,' said Greta, stimulating a shudders guesture by way of adding emphasis to her words. 'They screeched and scratched. They were neither of the stage nor screen. Just monstrous nightmares. I thought to myself, I I have to appear in anything like that I ought to go home to Sweden and stay there. ugh! Now-' and Greta threw back her head and laughed. I am bored to death when I see a silent picture. It seems that something is lacking: life is gone when the players fail to speak their lines." In the article Greta Garbo discussed there having had been being rapid technological developments in sound film while she had been in Sweden and mentioned her ability to fluently speak English, perhaps with little no Swedish accent. Not yet entirely completely refusing to be seen or quoted in public, she continued, "The public likes or dislikes a player solely upon what it sees of the player on the screen. I do not think a star's private life exposed in intimate detail serves any purpose than to satisfy curiosity. I am just a human being like anyone else. I resent prying into my personal affairs just as much as anyone in any other staOtion or position rightfully resists similar intrusions.'" It was a monthly issue in which Helen Ludlam had introduced The New John Gilbert and Fashion Editor Adrain had introduced himself, authoring an article that was accompanied by one of his sketches and a photograph of himself with Greta Garbo taken three years earlier. "Greta Garbo portrays the torments of love, but little else" was one photcaption that had accompanied Greta Garbo through the pages of fan magazines during 1930, specifically Picture Play Magazine, that had pages earlier praised sound film for having improved John Gilbert's image as a lover. Although correctly referred to a a hold-out for M.G.M, along with Lon Chaney, by author Richard Corliss, by then Greta Garbo by all accounts had made three sound tests, one from a monologue from Goethe's Faust, one a selection from Peer Gynt delivered in Swedish, and the other from Shakespeare's Hamlet, as Ophelia, the speech delivered in English. Norbert Lusk of Picture Play magazine was the film critic author Richard Corliss chose while deciding whom to select to relate the phenomenon of "The Voice: Greta Garbo's Sound films". To look at the article further and expand Corliss's quote, Lusk, who had serialized the photo plays of two reelers into fictional magazine adaptations, merely becomes perplexed by the baritone of Greta Garbo as the mystery of the Swedish Sphinx was to become more enigmatic and reach higher into the firmament reclusively. Significantly, or more significantly than is often viewed, by July of 1930, Talking Screen magazine has been added to the newsstand extra textual discourse. It read, "Gridley has fired. The Sphinx speaks! Greta Garbo has made a talkie. And the great myth of the movies- the legend of Hollywood- has received another tremendous impetus that will mean millions to M.G.ffM and it's sequestered Swede....according to director Clarence Brown...List to the oracle: 'I consider Greta Garbo one of the three Greta actresses the world has known, Bernhardt, Duse, and now Garbo.'" Author Herbert Cruikshank continued with his article Garbo Myth of the Movies More Amazing Than All the Mystery Stuff Is the Truth-Presented Herewith-Concerning Greta'" If not typical of the sentiment of the new adventure with sound, Talking Picture Magazine also went into publication as a proponent of the new moving, and talking, picture. The Film Mercury reported the return of Greta Garbo to the screen phlegmatically, comparatively matter of factly, during 1929, "With the return of Greta Garbo from Sweden, where she passed her vacation, announcement was made by M.G.M that 'Anna Christie' will be her next starring vehicle and incidentally her debut in talking pictures...In the picture, Miss Garbo will play the role created on stage by Pauline Lord...Clarence Brown will direct the picture, an all-talking version of the play, as soon as he finishes 'Wonder of Woman' in which he is now directing Lewis Stone and Peggy Wood." Other publications from the time period may seem more indicative of fan magazines in their following the chronology of the shooting schedules of any particular film of the era, and where criticism was left out, often a synopsis of the film's storyline was inserted, describing the characters and character action. "Greta Garbo will have Charles Bickford as leading man in Clarence Brown's production of Anna Christie for M.G.M. and not John Gilbert as was first reported." After announcing the coming of a new Greta Garbo film, Motion Picture News printed an extensive series of advertisements by Metro Goldwyn Mayer on the new season of film. "Greta Garbo will appear in two all talking and one silent picture" appeared above the full page advertisement in MotionPicture News paid for by Metro Goldwyn Mayer. It ran below, "Greta Garbo in Anna Christie. Her first All-Talking picture! There's a title that will blaze mightily from marquees all over this broad land in the coming season. Greta Garbo, the divine beauty talking to her vast public!..In addition to the All-Talking picture Anna Christie, Greta Garbo will appear in a secOnd All-Talking Drama, title shortly to be announced. This second speaking role for Miss Garbo is a vividly colorful characterization uniquely suited for her extraordinary beauty and talents. It will also be a silent production." "Garbo talar!!" 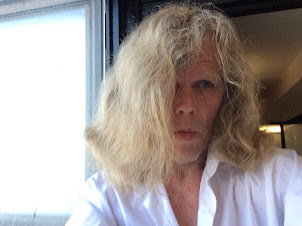 was the title decided upon for the webpage oauthored by Louise Lagerstrom of the Swedish Film Institute when the the actress was first introduced to European surfers of the Internet as having Omade her first sound film in the United States, which would happen to be where she made all her sound films to follow. Talking Screen Magazine during 1930 included the film "Anna Christie" in its screen reviews section, "Every single human being who admires Greta Garbo has been waiting with bated breath for the sound of her voice on the talking screen...All through this poignant drama of a girl who found love after her life had been thoroughly embittered by men, Greta's voice tells of her tragic story with compelling power." 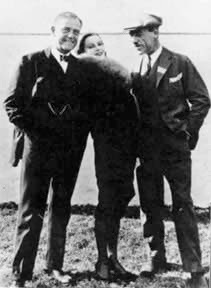 If it does seem more post-climatic than anti-climatic, actor John Barrymore had literally tried it first in an earlier film with synchronization, Pickford and Fairbanks both leaving their individual projects to co-star together shortly thereafter; Picture Play magazine speculated, "The Garbo Voice. What will it sound like? The Whole World waits to her the Swedish enchantress for the first time in Anna Christie." And yet, while audiences were waiting not all movie theaters were available for sound film and M.G.M divided their advertisement into a "Summary 16 Pictures Available for Theatres Without Installation: Greta Garbo, the flaming orchid whose seductive personality has made her an audience draw will appear in one silent picture, title of which is to be announced." While John Gilbert was scheduled to appear in his first sound picture Olympia, "Olympia:Title to Be Changed", Redemption, an adaptation of Tolstoy was being advertised as "A Fred Niblo Production, Screenplay by DorothPy Farnum". Before continuing to its advertisement of films "For Wired Houses", it included, "Lon Chaney in three thrilling silent pictures, the first Bugle Sounds. Titles of two more Lon Chaney silent pictures to be announced." Early during 1929, M.G.M. advertised Greta Garbo in PWild Orchids, "Sound or Silent", her having been assigned to "the most gripping story she's ever appeared in", and John Gilbert in Thirst "Equipped for Silent or Sound". Fred Niblo, introduced by a photo of Dorothy Sebastian in front of a microphone while filming one of her "new style scree tests, one for voice and one for photographic qualities", was attributed with having written the articles Crashing the Soundgates for Screenland magazine during 1929. The silent film director Niblo, noted in the photcaption for having directed Ben Hur, wrote, "Breaking into the talkie racket raises the ratio two thousand to one." Beneath them was a septagonal portrait of Greta Garbo Motion Picture News reported in July of 1929 that Greta Garbo was in rehearsals for Anna Christie, "her first talker". Picture Play magazine awaited the film, "At the very height of the talkie excitement, M.G.M. risked Garbo in an all silent picture in The Single Standard. It was a hit. Following her experiment in dialogue with Anna Christie, she may return to the silent fold, and I for one will not mourn. Garbo is a shadow. She suggests mystery, a mystery that has been in silence. What then will the spoken, tangible thought have to do with this peculiar appear? An out of character voice will ruin Garbo. She must speak as she looks- soft, alluring, and yet with a huskiness which her sophistication suggests...Always a good actress, Lilyan Tashman's throaty contralto has increased her prestige and emphasized her individuality. The talkie has given Conrad Nagel a new lease on popularity." In 1930, Katherine Albert penned the article Is Jack Gilbert Through for Photoplay Magazine. She outlined Jack Gilbert's power of script approval, notifying audiences that his first sound film, Redemption had been "shelved by the studio." and that she wondered if it would ever be shown in theaters. The article reviewed his performance as having been "nervous", "too highkeyed and "sel-conscious". In the same issue, Photoplay released stills from Anna Christie, "This Clarence Brown filming of the O'Neil play for M.G.M. is eagerly awaited by Garbo fans everywhere. Garbo's first talkie is bound to bOe one of the sensations of the next few months." "There are many things in your heart you can never tell a person. They are you. Your joys and sorrows- and you can never, never tell them. It is not right that you should tell them. You cheapen yourself, the inside of yourself when you tell them." While waiting for the release of Anna Christie (Brown/FeydHer, 1930), Picture Play magazine included a portrait of Greta Garbo taken by Clarence Sinclair Bull. Edwin Shallelert wrote, "Greta Garbo has gone to the extreme when exacting it within the studio itself...Greta Garbo has pursued the same phantom. The ordinary news gatherer, and the majority of the extraordinary, are not permitted on her set. It is told that once even some of her countrymen of the press came to visit and were ritzed, or felt they were." New Movie magazine devoted a page to Greta Garbo's first sound film, "Elsewhere in this issue Herbert Howe refers to Greta Garbo as the Hollywood Sphinx. But the Sphinx speaks in her next Metro Goldwyn picture, a new talkie version of Eugene O'Neil's Anna Christie once done by Blanche Sweet. Clarence Brown is introducing the Swedish Star to the microphone." The magazine also featured a portrait of Garbo dressed for tennis captioned, "The exotic Swedish star plays a great game of tennis. This isn't a posed sport picture. It's the real thing." Motion Picture News reviewed the film during 1929, "Her work is a sensation. Garbo has an exceptional talking voice, recording with a rich mellowness that exactly conveys her personality. A fine delivery of lines coupled with a splendid performance classes her among the finest of dramatic actresses...Clarence brown handled his direction with a deft hand that sustains the fullest interest in dramatic movement. His work is superb and the individual characterizations are particularly fine, with a small cast of four principals presenting sterling performances." It added, "Just as audiences repeat for Garbo in silent form, it is predicted the will do the same in her talker productions." "She was not pleased with the Anna Christie, writes John Bainbridge about a film that Garbo had first seen in the company of director Jacques Feyder and Wilhelm Sorensen, "'Isn't it terrible?' she whispered to them time and again as the picture unfolded. 'Whoever saw Swedes act like that?'" Although she apparently left early during the screening she visited actress Marie Dressler the following day with Chrysanthemums. Sorensen, after appearing in the refilming reversed their position, or emotion rather, "Garbo thinks this is one of the best pictures she has ever made, and she gives most of the credit to Jacques Feyder." Greta Garbo had worked out dialogue changes with the director during her second filming of Anna Christie. The character played by Dressler would in the second film be reenacted by Salka Viertel, who became, along with Mercedes de Acosta, one of Greta Garbo's more devoted companions during the period of early sound film, Feyder having returned to Europe after making the film, as had Hanson and Sjostrom. Garbo, who without entirely disappearing as though mysteriously, purportedly was travelling under the name of Gussie Berger, would infrequently be seen with Lilyan Tashman. 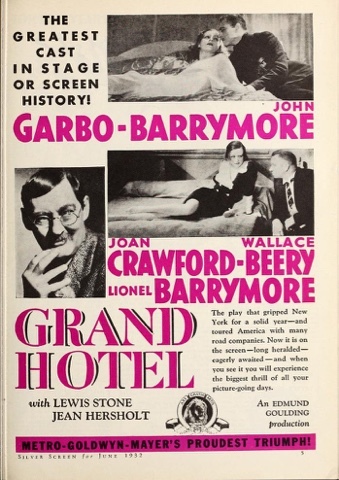 After retiring from film, Garbo would later register at hotels as Mrs Harriet Brown. 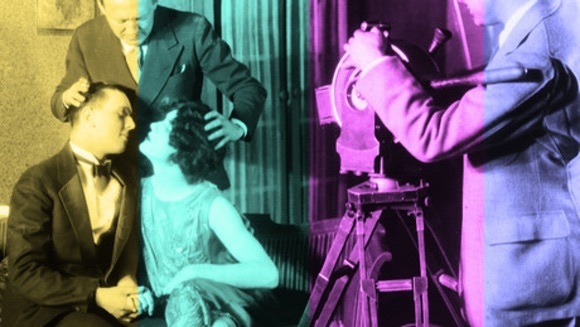 Author Paul Rotha hesitates; in his second quickly penned masterwork on the advent of the new art form of sound film, Celluloid Today, which followed on the heels of Film Till Now, while lamenting the death of silent film director F.W. Murnau, Rotha appraises the need for suitable roles for Greta Garbo, by then in his estimation, one of the greatest actresses, after her having been paired with Gilbert, of the silent era. he calmly included the film Anna Christie among a trio of films that accordingly are brilliant for the visual expression in their opening, but lapse into pure dialogue insufficient to explain character. Incidentally, if not coincidentally, if we return to the world of silent film and its era, biographer Lotte H. Eisner gives an account, in Murnau, of Salka Viertel having visited F. W. Murnau after his inevitably fatal car accident and the ensuing time before his premature death, "Everyone's private life is sacred....Venomous tongues did not fail to set to work in the great Babel of Hollywood. Not many people had the courage to come and bid the great director a last farewell in the funeral parlor 19 March: the two Viertels, Greta Garbo, George O'Brien, William K. Howard, Thomas Mirande, Edgar Ulmer, Herman Bing and three others- eleven people in all. For along time Greta Garbo kept the death mask of this man who had been as solitary she." John Bainbridge in his three part article for Life Magazine succinctly introduced a well known to us Greta Garbo, "Her talking-picture debut in the title role of 'Anna Christie' in 1930 was described as 'the most eagerly and fearfully awaited cinema event since talking pictures'. Her producer, M.G.M. Considered two words sufficient billing for the picture and those words blazoned across the U.S.: GARBO TALKS." During 1930, Metro Goldwyn Mayer specifically used the phrase again, which wholehearted encouragement, in advertisements proclaiming, "Chaney Talks"for the film "The Unholy Three." It admonished, "You know how M.G.M electrified the amusement world with 'Greta Garbo talks in Anna Christie'. Box office history will repeat when you tell them 'Chaney Talks'...No question but he will duplicate the stir and excitement caused when you advertised Greta Garbo's first talkie." 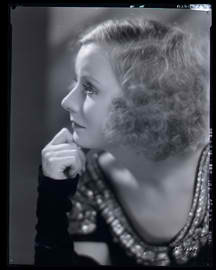 The magazine Hollywood Filmograph traced the early stardom of the entrance of Greta Garbo into sound film during 1930. It reported, "Niblo had planned to film Red Dust with Greta Garbo, but Romance was put on schedule ahead of this, so he will direct the Haines picture first, then Red Dust, according to present plans." It followed with the heading "Garbo in a new talkie", which read, "Forsaking the Swedish accent of Anna Christie for Italian dialect andP garbed in crinolines in place of sweaters and oilskins, Greta Garbo has started work on her second talking picture. Romance, an adaptation of the famous stageplay...Clarence Brown, who filmed Garbo's first talkie for Metro Goldwyn Mayer, is directing." Hollywood Filmograph then alluded to Garbo's then next film, "Greta Garbo will be seen in at least three productions during the coming season, the first of which will be Red Dust This is based on William Collison's story and presents the magnetic Swedish star as a Parisian." It later reported, "Fred Niblo, having just completed directing Easy Going starring William Haines at M.G.M., is right now preparing to direct Greta Garbo in her next story Red River which Fred De Grease is writing and adapting for the screen." Motion Picture News during 1930 echoed with a similar report on Red Dust, "M.G.M is preparing Red River as Greta Garbo's next talker following her current picture Romance. Fred Niblo is to direct upon finishing Easy Going. Red River is an original by Fred De Greasac and was formally known as Red Dust." With this was also, "M.G.M switches Niblo from Red Dust to Haines film- Fred Noblo will dGirct William Haines in the latter's next film for M.G.M, N original titled Easy Going...Niblo was originally scheduled to direct Red Dust with an all star cast but this has been postponed to follow the Haines picture so that Greta Garbo can take the starring assignment in Red Dust." The magazine later reverted to the title having had been being Red Dust and it having been based on a story by Wilson Collison, but it also carried an advertisement from M.G.M. itself, which read, "Greta Garbo in Red Dust" which claimed it would be Greta Garbo's third sound film. "The most unusual part she has ever played. On a Chinese rubber plantation her past in Paris is forgotten- gorgeous Greta Garbo gives the talking screen a performance such as you've never witnessed. This stageplay by Wilson Collison has the power of Sadie Thompson. It's going to be one of the year's greatest." The New Movie Magazine during 1930 looked at Garbo in regard to fashion. "The glamorous Garbo, away from the studio, affects dull tweeds and flat heel shoes. No expensive wardrobe for Miss Garbo. Yet she is Hollywood's most I'm lavish purchaser of lovely lingerie. She spends thousands every year on fancy underthings. 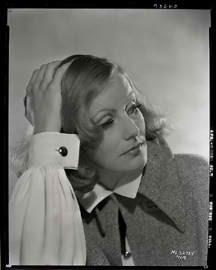 Above the photo of Garbo was a caption reading, "Spend between $5,000 and $25,000 on clothes." It continued pages later, "For evening Garbo is magnificent...She goes so little to social functions that one can do little speculating as to the number of outfits shew has, but the writer has seen a magnificent ermine wrap, with white fox trimming and several elaborate white satin, white lace, white chiffon, and white moiree gowns that could not cost less than three hundred dollars a piece." Within months the magazine added, "She wore a tan beret and a tan overcoat with a high collar and a pair of horn rimmed glasses. 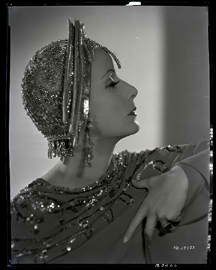 As time goes on the great Garbo seems to become more and more like a hermit." Another item read, "Greta Garbo loves spaghetti and never eats in the studio lunch room. Three years later the magazine interviewed the make-up girl at M.G.M., Lillian Rosini, "Greta Garbo has never used anything but the thinnest dusting of flesh-coloured powder, rather pinkish, and pale lip-rouge; nothing on her eyes at all. And by they way if I get anymore letters asking me if Garbo's eyelashes are artificial, I'll scream...I've been making her up for nine years...I ought to know her lashes are real. Advertisements sent by M.G.M. itself to Motion Picture News during 1930 relied upon the theme expressed on the cover of Exhibitors herald World, which almost comicly announced, "Greta Garbo talks again in Romance. Its her greatest"; after acknowledging the fame that Garbo had acquired by returning to the screen in a sound film, it depended on the recognition of her as an investment and it was discernably giving her press of its own, "Already the word comes out of Hollywood that Miss Garbo's new Talking picture Romance is destined to overshadow Anna Christie by far. There's no figure in all studioland whose screen activities are of such widespread interest. Long before a Greta Garbo attraction reaches the screen the magazines of the nation are heralding its approach, the public is breathless with anticipation. Its nice to have a Greta Garbo under contract to your theater. In 1930-31, the first of her three vehicles will Red Dust." Motion Picture Classic during 1930 noted in "Garbo at her best" that "It is probable that her latest and greatest photoplay, Romance marks the zenith of Greta Garbo's career. Garbo plumbs new dramatic depths. She adds new charm to her attractions, and is very much the star of the production...The selection of Gavin Gordon is less fortunate, but the shadow of the great Garbo softens the glLare of his defects." Directed by Clarence Brown, the screenplay to the film was written by Bess Meredyth and Edwin Justus Mayer. Richard Corliss saw "recognizable curtain lines" that were to almost harken back to the proscenium arc of "filmed theater" during the cinema of attractions, deeming the blocking of the film playlike, "It was as if Clarence Brown, the admirable technician, had died with the coming of sound, and most of his later films were directed not by his spirit, but by his shade. The result is a feature-length series of static two shots, of statuesque poses instead of felt guestures." The portrait of Greta Garbo in costume from the set of Romance published in Motion Picture magazine was photographed by George Hurrell. Adela Rogers St. Johns, writing in New Movie magazine gave a portrait of Greta Garbo that veers from her being a recluse in The Heart of Garbo, How the Plight of her Leading Man Touched the Sympathies of the Star Who Walks Alone, Gavin Gordon went to Hollywood because he found out that Garbo lived and made pictures in the distant land of which he had heard so much." A still of them in the film Romance accompanies the article with the explanation of how Garbo insisted that he be in the cast and that she sent him roses, it quoting the actor, "'And she helped me through those scenes so wonderfully.' he said,'She didn't think of herself and how it would be for her. She was so kindly, she always made it possible for me to do each scene.'" Journalist Marie Howe arranged for a "Screenland Scoop" by quoting director Clarence Brown on the set of the film "Romance". Brown was attributed with having said, "The public will find not this picture more of the Garbo they are used to, a different Garbo from 'Anna Christie' and yet essentially the same. A sophisticated woman of the world, a lovely open star who has a tender romance with a young clergyman. In the O'Neil drama they were earthy characters with a sordid background....She adores these crinolines and flounces. The tiny hats. And it is a lovely story. I like it myself." 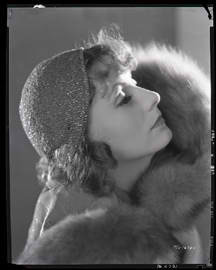 Silver Screen was attentive to fashion and style while during 1932 while publishing a portrait of Greta Garbo taken by Clarence Sinclair Bull, remarking that the hat Greta Garbo would wear in the film Romance would transform devoted Garbo fans into princesses, "Look at the portrait above and admire the new hair style. It's the latest and will undoubtedly go over with a bang as did the Garbo bob- with bangs in front." "Garbo- That's All! And that's enough for most people." Screenland magazine introduced Greta Garbo not only in her new talking picture, the film "Romance", but with a new portrait photographer, known only as "Hurrell", their two full pages an exclusive publication. "Love?" She laughed softly, "Of course I have been in love. Love is the last and first of a women's education. How could you express loveI'm if you have never felt it? You can imagine, but its not like the feeling- who hasn't been in love?" Faith Service, who had for more than a decade been writing about silent film and adapting photo-plays into magazine short-stories, printed the article "Garbo Never Sleeps- This is Her Tragedy- The Real Explanation of her strange life and her Broken Romance." Interesting to read, it contains what seems to initially be a plausible theory that begins to explain the mystery of Greta Garbo with, "The reason why she does what she does, the reason why she doesn't do the things other people do, the reason for her famous eccentricities and hermit-like existence, her lack of response to a social life, her lack of response to eager lovers is this- Garbo is an insomniac. She never sleeps." The article claimed that Mauritz Stiller had experienced bouts of sleeplessness before his death and go back and forth between rooms before finding a suitable bed, and that Garbo too had had mild instances on occaision that she was now using "constant sunbaths" and "endless walks up and down the beach" to preempt. It continued that John Gilbert's heart was still broken- "Garbo, too tired to love." Motion Picture Classic magazine during 1930 instructed, "To locate Greta Garbo, take out your binoculars and study the sun. Discover the hottest ray, locate where it strikes Hollywood and with the aid of a compass seek the spot. There you will find the mysterious one sunbathing. She never misses, so you will not have wasted a minute." Tiding from Talkie Town, in Talking Screen magazines during 1930, reported an affinity between Greta Garbo and Mary Pickford as well as a penchant on the part of Greta Garbo for solitary sunbathing. Marion Davies had confirmed Lady and Lord Montbaten as guests at an upcoming party, and they had in turn requested the presence of Greta Garbo. As the actress was unable to contact Garbo, Mary Pickford offered to speak to her on the behest of the now socialite actress. Pickford found Greta Garbo on her patio sunbathing and the invitation to the party was then declined. New Movie Magazine during 1931 reported, "Greta Garbo seems to be emerging from her mysterious seclusion. She gave Malibu quite a thrill lately when she came down and spent a whole afternoon on the beach with friends." 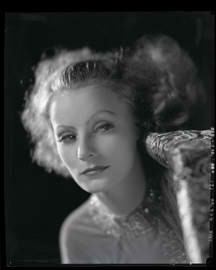 Journalist Cary Wilson later gave a portrait of the Greta Garbo he had met in Photoplay during 1936 claiming that he referred to her as "Fleck", which was short for "Svenskaflecka" and that he had first been introduced to her when she was standing on her head; she had been playing tennis which was then in turn followed by an hour's swimming and then another hour of hiking, "she still contained so much physical exuberance that standing on her head, on a sofa pillow, seemed to be the simple and desirable thing to do." Garbo had been winning at tennis after only having been playing for seventeen days. The extra-textural discourse depicting the off screen activities of motion picture actors, and sometimes directors, and more than often not the enigmatic ghostlike swirlings of the Swedish Sphix, Greta Garbo, whOoo was by then established as the most reclusive actress in Hollwood, included an announcement during 1932 in the magazine Hollywood Filmograph, "Humphrey Pierson, one of Hollywood's best known writers was signed today by Joseph I Schnitzer and Samuel Schnitzner to do the adaptation and screenplay of "Greta, the Great", which is said to be based upon the life of Garbo." Earlier it had reported, "A number of feminine stars in Hollywood are said to be worried for fear that their private lives will soon be public since it has been revealed that Rilla Page Palmborg, author of the sensational 'Private life of Greta Garbo' is at work on a second book. It is not known whether or not this book will be a 'private life' although the book is said to concern Hollywood." Close Up magazine during 1932 also reviewed the biography, "But Rilla Page Palmborg in The Private Life of Greta Garbo got dope from Garbo's private servants. For the first time one learned that Garbo buys all the fan magazines and asks for her money back if there is nothing in them about herself. For the first time one learns that Garbo's favorite breakfast is grape fruit, creamed dried chipped beef, fried potatoes, an egg, home made coffee cake and coffee." Biographer John Bainbridge goes so far as to quote Gustaf and Sigrid Norin and after giving a similar account of Garbo reading, and returning fan magazines adds to that her bringing her lunch to the studio in a brown paper bag. "She also made a point of seeing every film directed by Ernst Lubitsch and Eric von Stroheim- in her opinion two of the most gifted directors in Hollywood. She usually saw her own pictures two or three times, on different occaisions." To the account is added that she avoided beauty shops and that she rinsed her hair after shampooing with camomile tea, which the housekeeper brewed from camomile seeds. Although Adrian had visited the house and had arranged its living room furniture and decorated its interior, the butler is quoted as having remarked that Garbo was apathetic about it and the making of purchases for it. During the filming of Sign of the Cross, Movie Classic quoted the film's director, without him expressing any further interest in the mysterious Garbo, and yet there is an allusion to the seductive roles that she was trying to ascend in his typifying her as a woman that could gain power through sensuality, "'The most voluptuous-looking woman in Hollywood,' adds DeMille. "is Greta Garbo. She has true voluptuousness- not of body, but of mind.'". 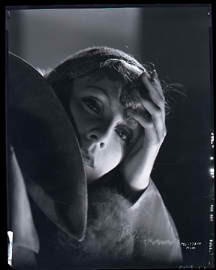 To end the silent era, two months before Greta Garbo's last silent film, The Kiss (Feyder, 1929), Clarence Sinclair Bull became the gallery photographer of Greta Garbo, photographing her through several years, only in costume and only on the (closed) set. Author Mark A Vieira writes, "She liked him because, like Clarence Brown, he spoke softly, if at all." 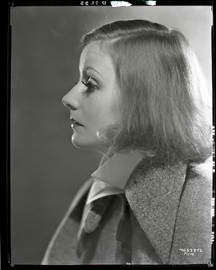 In an e-mailed correspondence with the present author, Mr. Vieira sent still photographs scanned from their original negatives in two seperate letters, their having been mostly left over and unused from the editorial decisions during the publication of his biography Greta Garbo, A Cinematic Legacy. One of the portraits taken by Clarence Sinclair Bull, as the reader will notice, is the one used on the cover of Mr. Vieira's biography without the publisher's title lettering. Vieira, who was an apprentice of Clarence Sinclair Bull, quotes Greta Garbo, "As she said, 'I had it all my own way and did it in my own fashion.' This is what ended her career and what makes her cinematic legacy the exquisite thing that it is." 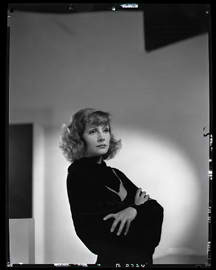 One portrait of Greta Garbo included in the Estate of Greta Garbo auction was a gelatin silver print on double-weight matte paper with Clarence Sinclair Bull's blind stamp from the film Susan Lennox Her Rise and Fall. Motion Picture Magazine during the release of Susan Lennox Her Rise and Fall was explicit, perhaps perfunctory, in its publishing a portrait of Greta Garbo by Clarence Sinclair Bull with the caption, "The One- and Only" Underneath read, "There's only one gown in the world like this, just as there is only one Greta Garbo. It was designed by Adrian. An exquisite portrait of Greta Garbo taken by Clarence Sinclair Bull appeared in Modern Screen Magazine in 1931 with the caption, "Although almost everyone in Hollywood knows where Greta Garbo lives, the swedish star hasn't moved for some time. Perhaps she's getting used to inquisitive fans peering through the hedges. She takes long hikes everyday and is usually accompanied by a woman companion." 1932 saw the article Garbo is like Lindbergh, written by R. Fernstrom and published in New Movie Magazine. "Garbo is like Lindbergh. They act alike toward publicity.They shy away from reporters. Garbo is like the King of Sweden in many ways- kind, but aloof to everyone." Greta Garbo was in fact the owner of a letter written in Latin by her majesty Queen Christina of Sweden to Joachim of Wickfort during 1651. The document had been given to her by her companions Count and Countess Wachtmeister. Biographer John Bainbridge gives an account of Greta Garbo and Countess Wachtmeister having been introduced while crossing the Atlantic during 1928 en route to Gothenburg, Sweden. It is a gendered spectatorship that places Garbo as a Cleopatra, who, as an alluring Queen, is looking at wealth as an abstraction in that to her it is aphrodisiac, her displaying herself as desirable admidst a backdrop of opulence; to know the secrets of her body is to be allowed by her within the solitude of grandeur. After Victor Sjostrom had returned to Sweden, Robert Herring, writing in Close Up magazine on Uno Henning in En Natt, a classic early Swedish sound film directed by Gustaf Molander, abruptly interrupted his essay to enter into a legnthy discourse oI'm n Greta Garbo, it being glaring that the section on Garbo is displaced in the essay, as if by overenthusiasm, to where he compares Garbo to Bridgette Helm only to stall with more on Greta Garbo before returning to Molander's film, "For with Garbo, too, there is the same sense of being linked to something more than one's personal life. Of carrying on and of being carried. 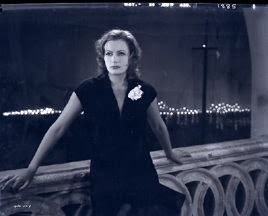 Garbo in love, uses her lover as a means of reaching that land, that mood, that peace she requires. That is what is so difficult for her leading men, and so hard to find scenarios in which her leading man can continued to be wooed...Garbo has never lost this, this restless quiet..It is what makes her sometimes tired, which the movies try to turn into langorousness; it is what makes her dynamic, determined...Garbo astonishes people by being alternatively strangely careless and suddenly precise, right and assured." Film Daily reviewed the film Inspiration, "Greta Garbo dominates every situation and is the Garbo the fans want....Miss Garbo brings to the screen all the great possibilities of her talents with a combination of heart-gripping emotion and carefree indifference." With the superlative photography of Clarence Sinclair Bull, Greta Garbo inherited Photoplay Magazine journalist Katherine Albert, who summarized her writing during 1931 by herself paraphrasing her, "I'm bored with Garbo. ", her looking at and foreward to the sensation differently with the articles Did Brown and Garbo Fight and Exploding the Garbo Myth, the former concerned with "the carefully guarded walled in stage where Garbo was starring in Inspiration, the latter making an event of Greta Garbo objecting to a line of dialouge on the set of the film Romance, including a photocaption which read, "the writer, who knows hers says there is not mystery about Greta Garbo". After explaining how successful artisticlly the work of Clarence Brown and Greta Garbo had been it asks what happenned during the filming of Inspiration, "The piece is an adaptation of Sappho. The book is now old fashioned. So is the play. A new script had to be written and neither Garbo nor Brown were entirely satisfied, but there was nothing to do but experiment on the set and see how it read. In order to get anything out of it, they must rehearse and rehearse and change and change. That's where the trouble began. Garbo would not rehearse." Photoplay reviewed the release of the film The Rise and Fall of Susan Lennox, "If you like your romance thick, your passion strong and your Garbo hot, don't miss this...M.G.M. stuck closely to the tale, modernizing it of course, and adding a trick ending. Garbo does her utmost with the tile role, natural for her." Beneath the review of Greta Garbo as Susan Lennox was a still photograph of Herbert Marshall, "English actor-husband of Edna Best", in the film "Secrets of a Secretary" with Mary Boland and Betty Lawford. Although the announcement may seem odd to this century, The New Movie Magazine in 1931 had reported, "King Vidor has selected Ernest Torreace for one of the important roles in The Rise and Fall of Susan Lennox, Greta Garbo's current picture." During 1932 it was well within the knowledge of "all the more studious Garbo fanatics" (Picture Play) that Greta Garbo was on the screen with Clark Gable, Their attraction to each other is understandable, their antagonism predestined, and their desperate reunion at the end of the picture holds no hope of tranquility." 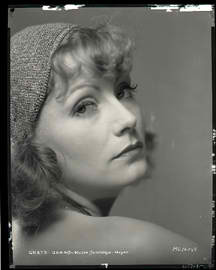 Picture Play thought highly of Greta Garbo adding, "Nor does she triumph in spite of her picture. it is a story entirely worthy of her." Richard Corliss includes Mata Hari with those films in which Greta Garbo's performance had been reviewed as "intentionally, or perhaps artisticly, lethargic". "M.G.M. had put Garbo through so many variations on the beautiful spider falling in love with the idealistic fly that the actress could have performed this part in her sleep- and more than one critic accused her of doing just that." During 1932 Regina Cannon directly quoted Ramon Novarro in New Movie Magazine in The Most Eligible Couple Will Never Marry, "Garbo is my ideal woman, but PI shall never marry." The "startling frank article continued, "No other woman has impressed me so much; not even Barbara La Marr. Greta is everything that man desires. She has beauty, lure, mystery and aloofness that only men understand, for it is a quality which is usually to be found only in men. It is not coldness either. It is emotion." Journalist Ralph Wheelridge chronicled the making of Mata Hari for Photoplay magazine, "Announcements of the co-starring assignnment for Mata Hari sounded signal guns for rumors, conjecture and prognostication of all description. Those who have seen Miss Garbo about the lot during the making of the picture commented upon the gorgeousness of her costume and her unruffled contentment." The author mentions that her co-star had only met Greta Garbo socially oOpn one or two occaisions, "On her dressing room table that morning Garbo found a huge mound of pink roses." He had sent a card reading, "I hope that the world will be as thrilled to see Mata Hari as I am to work with her- Ramon Novarro." Ben Maddox announced during the middle of his article Garbo and Novarro Together, Has Garbo found her Perfect Screen Lover at Last published in Screenland Magazine that he "had a long talk with Ramon during the making of Mata Hari. Ostensibly, little of it was about Greta Garbo, his quoting Novarro as having said, "Popularity is fleeting. So why should I be dazzled with a material success that is bound to end...However, I was delighted to do Mata Hari, it gives me an excellant role, one for which I am fitted. To me, the play is the thing. I like the co-starring plan. When one person alone is featured, the story is distorted to stress one character. 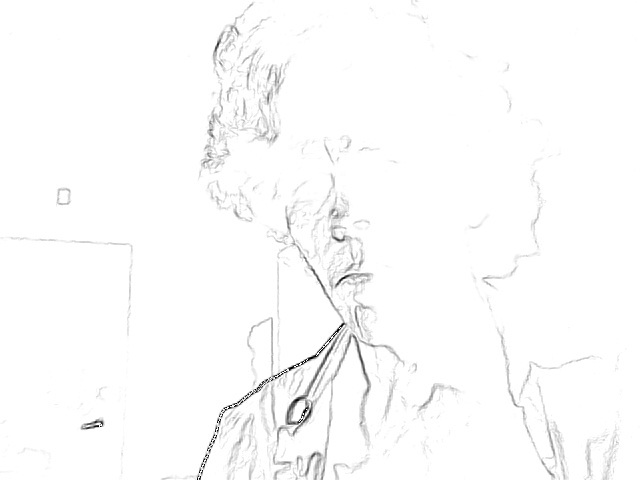 And as a result the picture cannot be dramaticly effective..After thirty something happens to you. You get a more serious outlook on life." To begin My Hollywood Diary, the last work of Edgar Wallace, his wife explains that he wrote his letters in diary form, her publishing those from 1932. in one representative of the time period, while discussing his having dinner with Evelyn Brent and Lowell Sherman, who introduced the topic of Mata Hari, Wallace wrote, "By the way all Hollywood is agog as to whether Greta Garbo will turn up at her premiere. most people think she won't." Wallace included a portrait of Garbo in the volume captions with merely "Metro Goldwyn Mayer" and related that people in Hollwood referred to Greta Garbo only as Garbo. He later added, On Saturday night, I forgot to tell you I met a Mrs. Glazner. Greta's reticence is not pose. She told me a lot about her. She was an assistant in a barbershop-used to mix the lather- then went into that where Tiller (Stiller), the producer met." Owing to that Edgar Wallace wrote novels about Scotland Yard, it is uncanny, or eerie that decades later we would not hold the belief that he had met Garbo, the actress, in disguise or traveling under a pseudonym. Scott Higgins, currently. Professor of Film at Wesleyean University and recently the editor of Arnheim for Film and Media draws a portrait of Arnheim as an outdated, archaic formalist lacking vision, but notes that the author, a proponent of the visual as the basis of aesthetic theory, maintained that "an action can gain expressive power through 'indirect representation'. This may be in part evident in Arnheim's 1934 piece on Motion, "When in Grand Hotel Greta Garbo walked through the lobby with a springy, dynamic gait, she produced not only the most beautiful moment of the film, but also the most telling characterization of the dancer, whose part she was playing. Sr risk of doing an injustice to the most animated face in the history of film art, it may be said that Greta Garbo could give equally strong expression to the human soul by the rhythm of her gait, which depending on the Occaisionalism was victorious Nd energetic, transfigured, or tied, broken anxious and feeble." Richard Corliss describes the work of Greta Garbo with director George Fitzmaurice, "As You Desire Me begins with a fascinating premise, and reworks a Pirandello play that seems intriguingly relevant to the creation of Garbo the star. indeed the film has everything going for it but good writing, acting and directing. For most of the film, Garbo looks as if she's simply fiinishing out her five year contract." Photoplay Magazine gave an eerie, perhaps unsettling, review of the film, " 'This may be the last Garbo picture you see' but at this moment she will not make any more now...if ever...And Garbo has never been more marvelous....The love scenes between Douglas and Garbo are the high points of the film and they are almost equal to the ones played so long ago by Gilbert and Garbo. if this must be her last picture, we are glad it is such a fitting swan song. And you don't need us to tell you not to miss the film." Picture Play Magazine during 1932 reviewed the film with, "There are only two kinds of fans- those who like Garbo and those who do not. Those who like her surely want 'As You Desire Me' to head the reviews this month, want praise of a more intriguing Garbo than has been for some time. I'm for Miss Garbo though and must say that her new film affords her one of her finer performances. it gives feeder range to natural talent for comedy....At the same time, she employs her reliable trick of expressing a whole speech in one husky monosyllable." 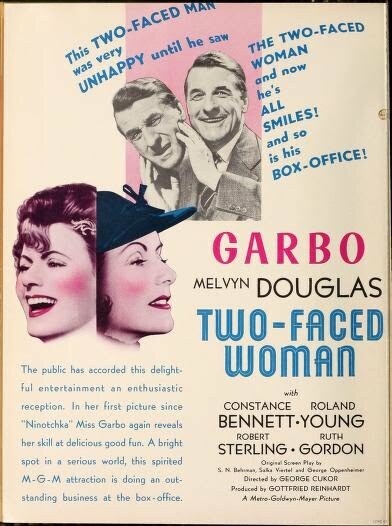 Actor Melvyn Douglas 'co-authored' the article "Why is Garbo great?" for Silver Screen magazine with journalist Patricia Keats during 1932. It began with the explanation that Greta Garbo was filming on As You Desire on location in Laguna, California and that Melvyn Douglas was sullen over having watched his own on screen performance in the film The Broken Wing during the previous evening, a film which he felt would compromise his bid for immortality or impair his relation with his audience, but he went on to give a synopsis of the plot to the new film in which he would be appearing, " 'Pirandello, as usual, let's you draw your own conclusions.'" The article continued to fulfill the promise of its subtitle, which had been "Melvyn Douglas, her new leading man, describes Garbo..'Since I have been in pictures,' Mr. Douglas continued, ' I have never met anyone as interesting as Garbo. I expected a cold, haughty woman who demanded thus-and-so by means of temperamental outbursts. But instead I found charming, emotional girl suffering from one of the worst inferiority complexes I have ever seen.'" d to Newspaperman Sorensen. That she had no intention of getting married." The magazine later continued, "WILL GARBO RETURN seems to be a much mooted question with the executives as well as the fans debating the question since the Swedish star left our shores, but she's still elusive." Movie Classic in 1932 reported that the United States was on tenterhooks as Greta Garbo neared the shores of Sweden, "She permitted a young American poet, named Philip Cummings to share her society- and even to laugh with her. And when her boat docked at Gothenburg, she was so excited that she actually summoned reporters to her! OShe told them- with a smile- that she was not afraid of reporters...but that she was tired of being written about so much. She added that she was not returning to America in the near future...She said she could tell no one her future plans." Movie Classic reported that while talking to reporters Garbo had to admit to the eventuality of her returning to the Hollywood screen. John Bainbridge gives an account of the events around Greta Garbo and her having departed for Sweden for an entirety of eight months. "Besides arranging to have her name omitted from the ships passenger list, she quietly slipped aboard the liner the night before it sailed. She had spent a period of weeks on an island swimming and sunbathing before returning to Stockholm, where she was visited by Mercedes de Acosta. She had read a biography of on encouragement of Salka Viertel about the throne of Sweden and of one who, during her reign, her "distaste of marriage was profound, she had swarms of lovers...she rewarded her favorites lavishly with money, land and titles...She also gave away half the crown lands." Garbo read the completed script to Queen Christina written Viertel and a colleague, it being made a stipulation of the renewal of her contract. She was met by Viertel on her return to the United States. Nearing the end of 1933, Hollywood Filmograph reported. "The famous Lola Montez- will be the next character that Greta Garbo will try as M.G.M have bought a story of the dashing Lola that vamped The King of Bavaria. The title of the story Heavenly Sinner, which has a glamorous, picturesque background and should exactly fit the mysterious one. That year the periodical published Looking through the Telescope, by Lal Chand Mehra, which outlined filmic spectatorship as being concerned with "the channels of the mystery of knowledge" and that the spectator remained distant and aloof so as to mystify the view, "Greta Garbo's greatest appeal in my humble opinion lies in the fact that this consummate actress always leaves an air of mystery about her. Even though she has portrayed ordinary human characters in all her pictures, she has carried an aloofness that the audiences never understand. This very distance has made Miss Garbo an attractive character...Her human portrayals are mystically beautiful. This question is- what can she do in a real mystic part?" Rilla Page Palmborg, the journalist, who has on several occaisions been credited with having created the initial "Mysterious Stranger" image of Greta Garbo in regard to the interpretations of Greta Garbo's personal life and how they were or were not neccesarily translated on to thOoe screen, returned to Photoplay in 1933 to write the article "Now Its $12,500 a week", the title coming from Garbo's apparently wondering if there would be an early retirement she would enter and if he current salary would compensate for her being neglected, "However that may be, Garbo is now busy with her friend, Mrs. Berthold Viertel, wife of the German motion picture directoI'm r, hunting a house and otherwise getting established. Metro is humming with excitement- and these matters stand untill the next development." 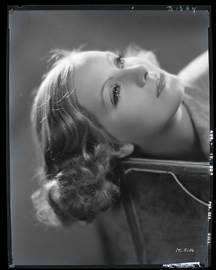 Garbo had returned from Sweden and "She didn't know whether she'd care to make pictures next year." To begin 1934, in Hollywood Reporter it was reported that, "M.G.M has quietly shelved The Paradine Case by Robert Hichens. Story was wrangled over as a possible vehicle for Greta Garbo, but no go, owing to a character problem that could not be cracked, to which it within months added, "M.G.M. cannot make up its mind as to the cast decisions for Indo-China, originally scheduling it under Bernie Hyman's wing for Constance Bennet, but now giving it serious consideration as possible Greta Garbo vehicle." It reviewed the film, "The magnificient Greta, after an abscence of over a year, makes a glorious reappearance on the screen...on the whole, Rouben Mammoulian's direction is admirable; S.J. Behrman's dialouge is scintillating; settings and costumes are rich." Tucked away in a secluded corner of a 1933-4 issue of Cinema Quarterly is a review of Queen Christina written by Paul Rotha. "I do not find it in me to write about this picture, but I must write instead about Garbo, who contrives, though Heaven knows how, to surpass all the badness they thrust upon her...Here a lithe figure sheathed in men's breeches and stamping boots, she strides into our prescence and again reveals her dynamic personal magneticism. She is a woman, it seems, destined to contrive in a world that spells misunderstanding...Queen Christina perhaps comes nearest; with its great close-ups and sublime fading shot. But the showman tricks of Mamoulian and the falseness of the environment conspire against her." Cinema Quarterly was also a magazine that published The Film Critic of Today and Tommorow, by Rudolph Arnheim, who wrote, "In an essay....Mamoulian was blamed for having allowed himself to be influenced by the "innocent vanity" of Greta Garbo. Almost simultaneously there appeared in a German newspaper, an interview in which Greta Garbo said, "You ask whether I am satisfied with the Christina film? Not at all. How could you think that? If I had any say in the matter, it would be quite different. But what one would like oneself is never realized. I shall never act the part of which I have dreamed." After continuing to write that he and his readers were not to be concerned "with a defence of Greta Garbo", Arnheim notes a creative dichotomy between actor and director, much like the one posited by silent film historians that saw the two reel film evolve into the eight reel during the time of Bitzer and Griffith where the scenario and photoplay emerged and developed. Hollywood magazine during 1934 published an article titled, "Garbo Finds Love" without revealing the name of its author, the headline reading, "The budding and blossoming of Garbo's romance with Mammoulian, as seen through the eyes of an actress who worked with her in Queen Christina, but for obvious reasons must remain anonymous." It began, "As one of those who worked with Garbo in Queen Christina, I saw her romance with Rouben Mammoulian bud and grow and flower into love. And I, like the rest of Hollywood, believe they will soon marry." The cover Movie Classic magazine hosted the title, "Will Garbo marry her Director". Between the covers, underneath an oval photograph of Greta Garbo as Queen Christina, read the caption,"Portrait by Bull". It stated, "Greta Garbo and John Gilbert were only a few feet away from the city clerk and matrimony when she turned away, shaking her head. 'I have changed my mind. ', she said. But now apparently the man for whom she has waited has now appeared. Rouben Mammoulian, the famous director of stage and screen, is that man." Journalist Dorothy Manners for New Movie Magazine that year asked, "Will Garbo Marry Mamoulian during an article in which she quoted the director, "Mamoulian only shrugs, 'The story that Miss Garbo and I plan to be married is absurd.'" Mamoulian, Greta Garbo and Salka Viertel had been dining together that evening. Silver Screen during 1934 observed, "The Garbo Mammoulian romance seems to develop steadily. The two have been quietly lunching at the Ambassador and dining at the Russian Eagle quite often lately." It was nestled on a page titled More Gossip-Whispers are Little Daggers. John Gilbert would make only one film after having been reunited with Greta Garbo in Queen Christina, The Captain Hates the Sea (1934). Bainbridge writes, "It was reported, erroneously, that when Garbo was informed of his death she said, 'What is that to me?' Actually she was vacationing in Stockholm when Gilbert died  and was given the news by a Swedish reporter in the foyer of the Royal Dramatic Theater during an intermission. She refused to make any comment; shortly afterward she left the theater." There is one account, if not more, that the role in Queen Christina was first going to be offered to Lord Olivier and was given to John Gilbert on Greta Garbo's insistence. According to John Gilbert himself, it may seem to have been. John Bainbridge chronicles that not only had Lord Olivier filmed screen tests and signed a contract, but he and Greta Garbo had rehearsed love scenes before his having had been decided against by the actress. Modern Screen magazine during 1933 briefly reviewed Queen Chrstina with the exclamation, "Triumph for Garbo. The picture is an unending series of exceptional scenes, packed with fine characterization a and good direction." it saw the film as a "comeback" for John Gilbert. Pages later it ran an article by Gladys Hall that began, "John Gilbert called me on the phone one night. he said, 'I am filing a complaint against the studio to have my contract construed. When I gave you the first story about my comeback, thanks to Garbo, I told you I'd give you the next big story that might happen to me. it happened." The title of the article was "Don't Send Gilbert into Exile" and it carried a rectangle plaque I between the two vertical paragraphs which read, "His fate is in your hands...write and tell us your opinion...It will determine John Gilbert's fate". it is eminent that Roland Barthes is looking at the final pullback shot of Mammoulian's film during the essay The Face of Garbo, irrespective of the pullback shot itself having been first developed by silent film director Clarence Brown and any contrived metaphor that that the frozen facial expression of Greta Garbo may have been Intended to represent a farewell to the silent era itself within the loyalty of nostalgia. Barthes writes, "It is indeed an admirable face-object. In Queen Christina, a film which has been shown in Paris in the past few years, the make up has the snow thickness of a mask: it is not a painted face, but one set in plaster, protected by the surface of the color, not by it's lineaments. Amid all the snow, at once fragile and compact, the eyes alone, black like strange soft flesh, but not the least expressive, are two faintly tremulous wounds....Now the temptation of the absolute mask (the mask of antiquity for instance) perhaps implies less the theme of a secret...than that of an archetype of the human face...And yet in this deified face, something sharper than a mask is looI'm ming." It may seem unavoidable that we question the fictional characters of Ingmar Bergman's film Personna on their isolated island as we look at the mythology earlier written by Barthes in 1957. Interest in "How Garbo became Garbo" was still flourishing in fan magazines during 1934, it seemingly artificially catapulted by the death of Mauritz Stiller in retrospect after the advent of sound film and articles persisted to peer into the childhood of Greta Garbo spent in Sweden. 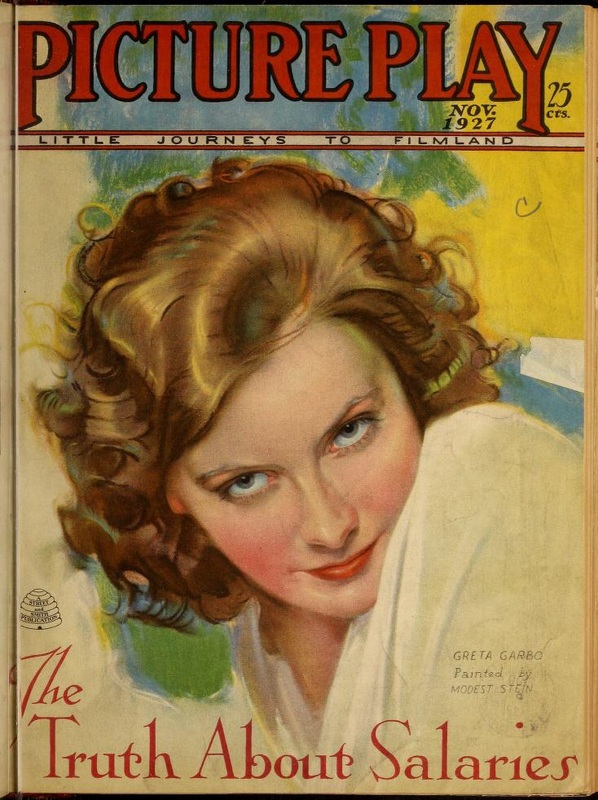 Photoplay published the article "Greta Garbo Wanted to be a Tightrope Walker" in which journalist Leonard Clairmontoutlined his making a film on the Making of Greta Garbo. He claimed to have travelled to Sweden to film Greta Garbo's grandmother, supplying biographical details to those interested in the young actress. "To film Greta Garbo's grandmother is not an easy task. If anyone thinks so, just try it...she just simply refused to be filmed." He added that the woman was then seventy six years old and had never seen her granddaughter on film. The grandmother as having said,"Because she was from the city, she thought she was a city girl and didn't think much of my cooking...She wanted to be a tightrope walker and tied ropes between the trees and had everybody in the place worried stiff." Reviewer Hal E. Wood contributed Garbo Frowns Again to Hollywood magazine in 1934, "Greta Garbo is anything but pleased over the action of Metro in signing assigning Victor Fleming to direct her in the Painted Veil. In fasct there are rumblings to the effect that the Swede is dusting off." The magazine claimed that Garbo wanted to leave for Sweden due to her lack of director approval and that she favored making a second film with Mammoulian, to which it appended, "Greta's lonely again" in its News Slueth section, "It's all over between garbo and Rouben mammoulian if you take the word of the chatters...Incidently, the star has rescinded her demand that Mammoulian, who directed her in Queen Christina be named her guide through The Painted veil and has approved Richard Boleslavsly as her megaphonist" Milton Brown photographed Greta Garbo on the set of The Painted Veil for The New Movie Magazine during 1934. It pointed out, "Notice the raised boards Garbo walks on to increse her height." A second photograph taken on the set of The Painted Veil by Milton Brown accompanying Garbo Starts Her New Picture took up more than three fourths of two pages in Photoplay, "Take 1- which means the first scene in Greta's new Metro-Goldwyn-Mayer film, The Painted Veil. The first call of 'Camera' for a Garbo pictYure is always a thrilling second. This time it stirred more excitement than ever before...All the sets for The Painted Veil were constructed on stilts, as this photograph reveals. The set has a ceiling, which is unusual from a scenic angle." Hollywood magazine during 1935 printed the article "Garbo's Cameraman Talks At Last, where William Daniels was quoted as having said, "She has been pictured as gloomy, aloof, frightened, imperious and a hundred other things as unlike her real self as are midnight and noon. The real Greta Garbo is the most sensible woman I have ever known. The keynotes of her character are intelligence, simplicity and absolute sincerity....Garbo likes to look through the camera to see what the scene is going to look like, but she does n't thrust her opinions on any of her fellow workers....She almost never troubles to look at the 'rushes' of her films, nor even at the first rough assembly of the picture. Instead she waits for the previews." 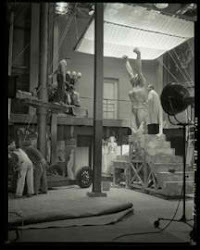 In the article there is a photo caption reading, "Camerman Daniels wants to photograph Garbo in color. He believes her complexion is the loveliest he has ever filmed." William Daniels is quoted by journalist William Stoll as having related, "When it came time to film retakes on The Painted Veil, Director Boleslawski had been called away to another studio, so W.S. Van Dyke took charge. He is probably the breeziest, quickest shooting director in the business, he literally cuts and edits his pictures as he shoots them. Our first retake was a scene of Miss Garbo coming down a long flight of stairs. we made the shot- once. Van Dyke said to me, 'Okay-wrap it up! Now, let's move over here!' Miss Garbo's face was a study; then she slowly smiled and saOid,'Well, I suppose there is only one way to walk down stairs.'" Memory would be insufficient to serve in regard to the often related story about Greta Garbo's slippers as to whether it originated with Mauritz Stiller or William Daniels, but as Hollywood folklore, John Bainbridge whispers that it was Daniels, "Whenever possible, she wore an old pair of carpet slippers on the set for the sake of comfort. before a scene was shot she always asked Daniels, 'Is the feet in?'. If they were out of camera range, she kept the slippers on, regardless of what fabulous Adrain creations she was wearing." Perhaps, the wearing of slippers had prompted her remark to Daniels about how an actress should descend a staircase. Greta Garbo departed from her usual portrait photographers for four photos "posed exclusively for Photoplay", her reconfirming herself as a fashion model as the two page layout "Garbo's first fashion sitting in five years" described in detail three gowns that Adrian had designed for the film The Painted Veil. The first of which was a gray silk teagown, with pleated organiza jabot and deep dolman type sleeves. 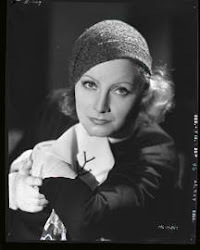 The second article photograph was described as "the sports type of thing Garbo loves- nonchalance in the swagger lines of a white flannel coat" whereas the third included "a new version of the famous Garbo pillbox hat," and a corded felt with jade ornament. Richard Corliss writes, "Boleslawski's visual effects Phere are adept without being ostentatious- as when Garbo looks distractedly into a window, and the reflection shows a much more disturbed face." John Bainbridge quotes director Richard Boleslawski, giving the impression, as elsewhere, that Greta Garbo approached acting in a professional manner, if not meticulous in regard to scene study, business-like in any event about the demands of the art, perhaps learned long before at the Royal Dramatic Academy in Stockhom. Boleslawski had said, "She was so completely thorough in her art that one found her almost as marvelous as the camera itself." Bainbridge goes on to descroibe her dependable punctuality while working for the studio and her being not only "letter-perfect in her lines" but that she would also know the lines of the actors that were to play alongside of her. Photoplay magazine journalist Otis Wiles affirmed What It's Like to Work with Garbo, with the claim that " Herbert Marshall's intimate revelations about Greta Will Suprise You." The article explains that Marshall was scheduled to film on adjacent sets, and that while he was finishing The Outcast Lady, with Constance Bennet, Greta Garbo was beginning production of The Painted Veil. Marshall, thinking that the make up for one film was too dark for the other went over to what was to soon be his next assignment. Richard Boleslavsky had built an entrance way to the set on stilts that were four feet in height. " 'Miss Garbo was in her portable bungalow,' said Marshall. 'She was told I was on the set to do a test and she flew out of the bungalow. I wasn't kept waiting a second. She came to me smiling and with a very friendly hand extended toward me. She said, 'Marshall, there seems to be some nonsense about make up...If your make up is wrong I will change mine.' of course I wouldn't permit her to go to all that trouble, but the incident gives a clear insight into the kindly, cooperative charcter of the woman." Marshall at the time was renting the home of Director Edmund Goulding. Photoplay gives an account of one afternoon Herbert Marshalll returned after work to find Greta Garbo and another woman on the tennis courts of the estate, playing "skillfully and gracefully"; she had taken Goulding up on a standing invitation she had obtained. Photoplay during 1935 almost couldn't have seemed more inaccurate, it having printed, "Garbo from all indications to make Hollywood her home on her return. She's going to bring her two brothers with her." Silver Screen toward the end of 1935 reported, "From Stockholm comes news that Garbo is busy these days finishing up a scenario based on the life of a saint. Her fondest dream has been to star in a picture with a religious theme, and the studio offering her none, she has written her own script." In regard to the mystery of Greta Garbo, Stockholm reported in Motion Picture Daily during early March of 1936, "Greta Garbo will leave here tommorow aboard the Drottingholm." More than two weeks later, in the same periodical, Gottenburg reported, "Greta Garbo is expected to sail tommorrow for the United States on the Gripsholm." The periodical soon ameYÿnded, "Greta Garbo, who arrived Sunday on the Gripsholm from Sweden is shifted to leave for Hollywood this afternoon." but with very little explanation spotted Greta Garbo in Chicago, "Greta Garbo and Berthrold Viertol had an exciting time here between the arrival of the Twentieth Century and The Chief. They went to the Field Museum and looked over the mummies." 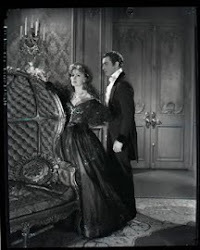 Photoplay provided a brief review of Greta Garbo in Anna Karenina during 1936, "The persuasive genius of Greta Garbo raises the rather weak picture into the class of art. Fredrick March is unconvincing as the lover for whom Greta sacrifices everything." It later rewrote its review, "This picture is really a weak and dull picture. yet the persuasive genius of Garbo raises it into the class of art. What should be moving seems dated, though the production is magnificient...But Frederick March seems stuffy." Film Daily reviewed the film not unsimilarily, "Greta Garbo in a sympathetic role that fits her admirably...with a fine appreciation of the poignant drama with all its subtle evaluations....Garbo has never appeared more hI'm uman and appealing." Motion Picture Daily's review of the film included the assessment, "The Tolstoi novel of Russia, containing as it does dramatic elements repeated time without end in many and far less distinguished pictures, make a fitting vehicle for the screen's leading tragedienne...Anna Karenina, slightly ponderous perhaps from the view of story, is nevertheless, a thoroughly worthwhile motion picture directed by Clarence Brown with pronounced ability." Picture Play magazine looked at the film as a remake, "So old that it served Garbo before she broke her silence and lapses into her present perfect speech. Then it was called Love. The new version is more interesting because it is more painstakingly done, speech giving it new refinements and subtleties. meticulous costumes and seetings complete a marvelous reproduction of St Petersburg society." Motion Picture Daily early in the year reported, "Basil Rathbone intends to leave for Hollywood in six weeks. He has turned down an offer by M.G.M. to appear in Anna Karenina with Greta Garbo and Frederick March. Rathbone is anxious to play the Sidney Carlton role in Tale of Two Cities, but he will most likely be signed by a company other than M.G.M." A month later it announced, "Reginald Denny goes in to Anna Karenina, which stars Greta Garbo at M.G.M." Basil Rathbone wrote of his aquaintance with Greta Garbo in his autobiography In and Out of Character- one of my copies mysteriously had the Players Cigarette Card featuring the actor from 1938 scotched taped to the inside cover, which, not unlike the persian slipper, the present author still keeps in my wallet- "I first met Miss Garbo in 1928 when Ouida and I were invited to lunch one Sunday." Rathbone and his wife had been present at the premiere of the film The Flesh and the Devil. There is an account that it had been Adrian that had designed the costume that Greta Garbo had worn to a party given by Basil Rathbone and Ouida Bergere during 1929. She had attended Mrs. Rathbone's affair as Hamlet. Of his starring in the film Anna Karenina with her he wrote, "And so upon the morning previously arranged I called upon Miss Garbo. The house, a small one, was as silent as a grave. There was no indication that it might be occupied." The atmosphere may not quite have been as conducive to a seance that Valentino would have attended as Rathbone may have made it out to be. Jane Ardmore's biography of Mae Murray, The Self Enchanted- Mae Murray: Image of an Era only briefly mentions Basil Rathbone or Greta Garbo but it is an account of off-screen Hollywood, there having been a diegetic and non-diegetic aspect to the extra-textual as well. Rathbone had starred with Mae Murray in The Masked Bride (Christy Cabbane, 1925, six reels). "Every fourth Sunday, Mae threw open her house for lavish entertainment...Jack Gilbert brought Greta Garbo. They were in love and radiant, but Greta worried about the studio, she was shy, there seemed such commotion, her energies were sapped. 'You should have a dressing room as I do, Darling," Mae had told her. Mae Murray would later be attending a birthday party for Rudolph Valentino given by Pola Negri. On learning that Greta Garbo had already had the film Mata Hari in production, Pola Negri deciding between scripts that were in her studio's story department chose A Woman Commands as her first sound film, in which she starred with Basil Rathbone. Of Rathbone, she wrote in her autobiography, "As an actor I suspected basil Rathbone might be a little stiff and unromantic for the role, but he made a test that was suprisingly good. In an article titled Hissed to the Heights- That's Rathbone, written during 1936, Motion Picture quoted the actor, "Before I played Karenin I was puzzled about the technique of film acting, and wasn't satisfied at all with what I had been doing. During the filming of Anna Karenina I watched Garbo and learned from her what I think is the secret of good screen acting; play your part with the least possible movement and the greatest possible mental projection. It is different on the stage. There your whole body is constantly exposed to the audience and you must have perfect coordination from head to foot....And Garbo has this power of mental projection to a superb degree...I first met her in 1928. I found her very intelligent and charming. I didn't meet her again untill 1935, when we were cast in the same picture. She wasn't the same person, she had changed. You know I think Garbo suffers a great deal for being typed typed. Her camerman thinks so too." "And now in Anna Karenina she becomes newly romantic." To the left of a portrait of Greta Garbo taken by Clarence Sinclair Bull, a caption read, "And on her return from Sweden, she may do Camille." Screenland magazine made the fantastic announcement, "And here's another thing that concerns Miss Garbo. for years Fred Niblo has been trying to interest the financial powers at Metro in a story by Barney Glazer on the Emperess Josephine. unlike other yarns that mention Napoleon, he is to be, in this, a secondary character. it being women's day, the author feels the women of history should have their due. now it looks as though the deal will go through, and Greta will play Josephine." Screenland printed the article in August of 1930! M.G.M's own advertisements featuring Greta Garbo in Motion Picture Daily during 1937 told audiences, "Garbo and Boyer in Beloved. You'll hear plenty about it." During 1937 The Film Daily chronicled the interest Clarence Brown held in the script of Conquest, "Countess Walewska, M.G.M. Greta Garbo picture has literally become a 'Clarence Brown production'. Valuable tapestries, silver candlesticks and tableware that once graced the palaces of the Russian Czars, but which have adorned Brown's (Californian) ranch home are used as props in the picture." The magazine went on to explain that brown was a collector and had a letter in his library that was "the basis for one of the dramatic highlights of the vehicle," it having been written by a dying French Soldier. Motion Picture Herald, not entirely of a different opinion, reported that Greta Garbo had read the novel written by Waclaw Gastrorowski and asked Irving Thalberg before his death to adapt the romance of Maria Waleska. The script assignment accordingly went to Bernard H. Hyman. it elaborated that there had been "intensive exploratory research" and that "hundreds of thousands of feet of film were photographed and several secret previews were held prior to its being shown to press audiences.". Ruth Waterbury announced that Garbo would soon appear in the film Countess Walewska wearing a new type of jockey a cap, which would have a "deep long bill hanging down in front." Of the script, Richard Corliss later wrote that it was, "a model of civilized wit, which Clarence Brown direct with a rigorous lack of style that seems almost personal. 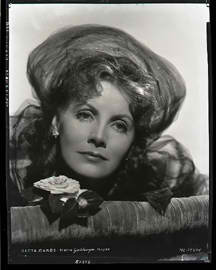 But there is little of Garbo to comment upon untill the last scenes." Picture Play magazine that year had published a portrait of Greta Garbo taken by Clarence Sinclair Bull captioned, "Divine Lady; Garbo as Marie Waleska in Conquest." It also had published an article by Helen Louise Walker with the subtitle, "Garbo casts a spell of silence over those who know her well. They cannot talk about her even when they try. Why is this?" During November of 1937, Life Magazine featured Greta GarboGreta on its cover. 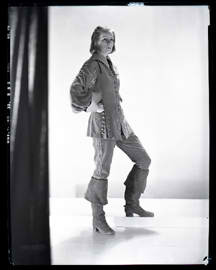 She was again in studio costume as she was often, if not exclusively, photographed. it announced that the front cover portrait of Greta Garbo as Countess Waleska in M.G.M's latest production Conquest" had been take by Clarence Bull. The article in between its covers showed photographs of her birthplace, the barbershop where she worked, a childhood photograph of her, a photo of her as a child at school and publicity photos from the film Peter and the Tramp taken with her in a bath suit, before going on to include her in publicity photos with her leading men from silent films made in the United States. The article was title with the heading," After Twelve Years Greta Garbo Wants to Go Home to Sweden, the recluse of Hollywood longs for the scenes of an unhappy childhood." 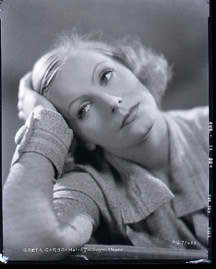 Greta Garbo is reported to have mentioned to the press that Camille was too tragic a character, intonating a reluctance in regard to the studio's assignment. In Gabo Talks at Last- And Here is the Romantic Romantic Reason For Her Silence, printed in Photoplay during 1936, Jim Mason gives an account of meeting Garbo. "Garbo talked to me on the train that was bringing her to Hollywood...at first she refused to see me..she granted an interview that lasted twenty minutes...the longest exclusive interview she has given. 'I really want to find as much solitude as I can,' she said. 'I do not know why I should talk to people i do not know, but I am beginning to learn that it is necessary...They say I am difficult to talk to-Ah if you only knew how hard I've tried...Sometimes I become upset. When i arrive at a railway station and crowds force in and around me. I want to run...I can not say how long I will stay, a year, perhaps longer. I love it here, but I love Sweden, too. Its hard to say." It was then divulged to the readers of Photoplay that there were the remanants of a former romance, "The real reason for her change of heart is apparently George Brent." The Camille of silent film actress Bernhardt remade by Greta Garbo was remade by several silent film actresses. The production of Camille (Kameliadamen, George Cukor,193) included screenwriter Frances Marion. Film Daily reported during 1936, "Greta Garbo has spent three full days this week in Adrian's studio going over designs for the costumes of her new starring production, Camille. During 1936, Photoplay related that Robert Taylor during the first week of filming had been without any contact with Greta Garbo, that he hadn't yet glimpsed her, his having been told that she was "making tests and couldn't begin work". Later that week, after his finally appearing on the set without out her, Photoplay directly quoted the actor, "'I thought this Garbo thing was a myth,' he mumbled." Later, it featured a two page fold of on the set photographs, "With these pictures, taken at the closely guarded set of "Camille", Photoplay proudly presents to you for the first time Garbo in color- and how lovely she is....Behind Cukor is Bill Daniels, Garbo's only camerman. Bill was rushed to the hospital twice during the shooting, but Garbo serenely waited for him. She will have no one else shoot her pictures." John Bainbridge quotes director George Cuckor as having said, "While we were doing Camille, Garbo didn't talk much to Robert Taylor. She was polite, but distant." Later during 1936, Photoplay added, "At M.G.M. we discover that Garbo and Robert Taylor are still making Camille- still on a sound stage that is hermetically sealed against visitors." Ruth Waterbury was so thrilled with her performance that while praising the actresses' enactment of the death scene, she sugIgested that Greta Garbo star in Marie Antoinette, "if Shearer decides not to make it." A photocaption in the article reads, "Garbo, entering her eleventh year as a star had to die- to live more glamorously than ever." It announced that she would appear as the Countess Walewska wearing. New type of jockey cap which would have a "deep long bill hanging down in front." The whereabouts of Greta Garbo in 1936 was in most ways far from being kept entirely in secret; according to Photoplay Magazine, garbo owned a villa in Nyokoping, Sweden and was celebrating her thritieth birthday. During 1937, it confidently mentioned, "Garbo will make another picture instead of a trip to Sweden." 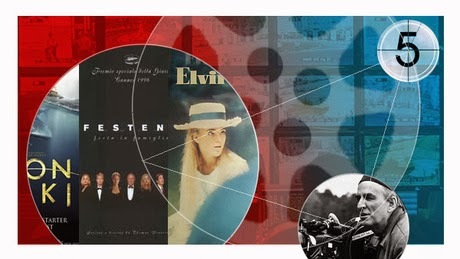 The Swedish Film Institutute (Svenska Filminstitututet), which provides an extensive cataloging and data asking of the history of Swedish Film production from its early silent beginnings to the present, is thorough in its filmography of Greta Garbo, thorough enough to have listed her being included in the film The Romance of Celluloid (Celluloidens romantic), made in 1937. Eliza Shallert of Motion Picture Magazine contributed the article With Thalberg Gone Will Garbo Retire? Her reasoning began with the death of Thalberg. "Her latest production of Camille was started by him, although carried to completion by others." Her review of the film touted a more intense Greta Garbo, "When Camille is released, audiences will behold a Garbo more beautiful than at any time in her career. And they will see A Garbo so frail, that breathing itself will appear an effort.."
It was only after my recently revisiting the Gothic Hammond Castle, built on the Massachusetts Coast in 1929, that I read that it was a "secret hideaway" of Greta Garbo. More publicity has been given to it by moderns who persist in their claim that it is haunted and has a Swinging Chandelier, but the visitor to the vista of Norman's Woe, which provided the location to Longfellow's poem The Wreck of the Hesperus, will be informed that the swimming pool in its courtyard, which is encased in a glass canopy and houses a statue of St. Mark, was often used by John Barrymore. It was the favorite room in the castle of Greta Garbo when she visited with Stockowski. Nor was I aware, it also being seemingly omitted from fan magazines, that it is has become public knowledge that Greta Garbo owned a oceanfront estate across Gloucester Harbor on Dolliver's Neck also built by the Hammond family, erected in 1935 and sold before 1950, which she used during the summer. but interestingly, it was in Picture Play Magazine in A Woman Alone, published in 1937 during the release of Greta Garbo in the film Conquest, that journalist Helen Louise Walker depicted Greta Garbo as mysterious rather than eccentric while reported that she was without owning a home in Hollywood an inhabited only rented dwellings. "She does not care what is inside the house. Apparently she never moves a vase or changes the angle of a chair or the position of a picture. The astonished owners return to find everything as they left it, not one telltale detail to prove that one of the world's most glamorous woHmen has been living there. Nothing is marred-Greta Never giving parties- no china has been broken, everything is spotless...Just now Greta is occupying th Niel Hamilton house in Brentwood...She employs a butler-houseman...and she changes servants rather often. Once a pair of trusted servants betrayed her trusted confidence- and took money for it." Walker related in the article, "'At first they hung spangles on her,' Adrian told me. 'They considered her a sort of decorative prop. I saw that she was like a tree, with roots deep in the earth. You must never put an artificial jewel or imitation lace or fur on Garbo'" It seems understandable that Adrian may have only consented to interviews with caution, while on the other hand eagerly seeking them out when available. As a margin note, John Gilbert performed in Boston in a theater still open for performances of classical music which has no lingering blythe spirits other than Charles Dickens. Ruth Waterbury writing in 1938 for Photoplay added interest to the unreachable, nonavailable Greta Garbo, an untouchable star in the firmament, he having scheduled with M.G.M. make up man Jack Dawn, "First of all, he didn't think much of the way my hair was done...a grand girl named Olga came along to do something about that...I had heard she was Garbo's hairdresser so while she worked on me head, I worked on Olga trying to get Garbo information from her...well, she got further than I did." During 1938 Motion Picture Daily printed the announcement, Garbo-Stockowski to Wed, "Greta Garbo and Leopold Stokowski will be married," the location was planned as being in Europe. "It was stated her today by the M.G.M. office and Wallace Berry will be the best man. No date was given." Within weeks it recanted with, "Garbo today denied to the press that she was married to Leopold Stockowski or intended to marry him." Garbo Unhurt in Mishap drew the eye of the reader of Film Daily during 1938 to a report received from Stockholm by newcable. Leopold Stockowski apparently had been behind the wheel with Greta Garbo when the vehicle overturned while skidding. "After righting the car, the couple resumed their journey." Richard Corliss writes that there were discussions about Greta Garbo starring in the film Tristan and Isolde with Stockowski, which was upon his suggestion, but that when their 'affair', or involvement, had concluded, so did plans to put the film into production. Jim Simmons claimed to have talked with Greta Garbo after having chased her limosine with his car and published I Won't Marry Stokowski says Garbo in Photoplay which dispelled accounts that to two were to be wed, "'No,' she told me, 'No, I will not marry Mr. Stokowksi.' It was one of the rare interviews ever obtained by anyone from the glamorous star herself. The only one in which she openly discussed current romance rumors concerning herself." Anita Loos, the screenwriter, whom had known Stokowski and had encountered Greta Garbo causally, during walks, had introduced the two by inviting Greta Garbo to a party, at his request. Modern Screen also reported on the lovelife of Greta Garbo during 1938, "The rumors that Garbo's real romance is director William Wyler still float around town and Wyler is the most surprised guy in Hollywood because he's never met his alleged lady love". Apparently Wyler had quipped to a reporter's query when asked about his private life by having replied," I've been seeing a lot of Garbo lately.". The columnist had taken him too literally, to which Modern Screen responded with the summarization, "That's Hollywood." Motion Picture Daily in 1938 announced, "Delaware Asks Garbo for Historical Film. Greta Garbo is likely to make a film based on the life of Argmegot Printz, daughter of Johan Printz, an early govenor of Delaware, it has been disclosed here...Sigfried Edstrom, chairman of the Sweden Tercentenary Commission in Stockholm has sent word here that he has talked with Miss Garbo on the subject. She will be more than willing to undertake the film if it can be arranged with M.G.M. Edstrom reported." Similarly, Film Daily during 1940 had been privileged to the Metro Goldwyn Mayer program for the coming year, and predicted the "Stellar Arrangements made", which included Greta Garbo in "Madam Curie, based on the biography by Eve Curie, the scientist's daughter." It had earlier reported in 1938 that "Sidney Franklin has become a producer for Metro Goldwyn Mayer....Franklin's second film will be Madame Curie, starring Greta Garbo." The magazine noted that there was to be "a new screenplay now being written by Aldous Huxley." The magazine recapitulated by noting that Garbo was in fact allowed to be loaned out to other studios while remaining with M.G.M, "Warner Bros. are reported negotiating for the services of Garbo in a picturization of Mr. Skeffington....It is understood that Metro has shelved Madame Curie in which Miss Garbo was to star." 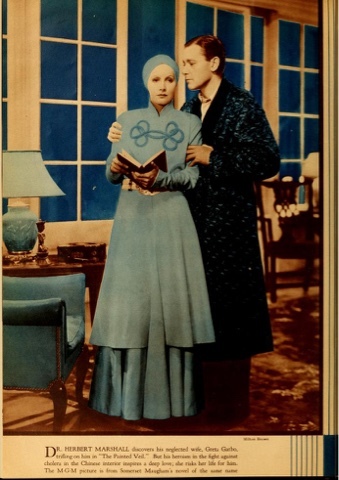 Motion Picture Daily during early 1939 included the film under "Titles Announced" and prognosticated the filming of "Madame Curie by Eve Curie starring Greta Garbo and Ninotchka directed by Ernst Lubitsch." Bainbridge again quotes Greta Garbo through an unnamed source, "One member of the cast wondered if his ears had decieved him when he heard Garbo say, 'If you start to worry, it gets you down, especially in Hollywood.'" He on the pretense that he would quote he through he director, he adds, "Having shunned, as usual, looking at the rushes, Garbo did not see Ninotchka untill after it had been cut and edited." 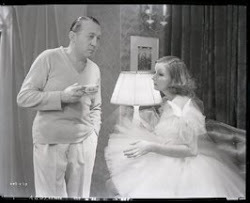 He quotes Lubitsch, with whom she had seen the film during an arranged private screening, as having felt that she was indecisive about the quality of her performance when asked. Motion Picture magazine during 1940 printed the article "Will Garbo marry Hauser?" with the caption, "The Greta Garbo- Gaylord Hauser romance is still going strong after six months. She may take the plunge." As a biographer that certainly had researched fan magazines, Bainbridge does in fact refer to them as "gossip columnists", implying that they could often form a consensus. While coming to the premiere of Ninotchka, he readily delved into Mercedes de Acosta having introduced Greta Garbo to Hauser, an author of a book of recipies beneficial to health and who had made for her wild rice hamburgers, consisting of eggs and rice, and broiled grapefruit. He had given her a diamond ring and had brought her on vacation, the two together on a yacht for more than two weeks and his having given advanced notice that upon their return; the wedding he had planned had been either postponed or cancelled indefinitely. The sentiment about Greta Garbo last film was crystallized by The Film Daily with "Hub Won't See Garbo Pic", which read, "The Garbo picture Two Faced Woman definitely will not allowed to be shown anywhere in the Metropolitan Boston area." Motion Picture Daily during 1941 elaborated on the "Condemned List" of the National Legion of Decency and their explanation of the film The Two Faced Woman having been placed on it and the ensuing debates on its censorship. "The Legion gave as the reason for the classification its belief that the picture is 'immoral and un-Christian in its attitude toward marriage and its obligations; imprudently suggestive scenes; dialogue and attitudes; suggestive costumes.'" A revised version of the film that otherwised would not have been released was shipped by train, du to their being a ban on shipping the film by air. The revision involved, "elimination of certain items of dialouge and scenes. It is learned that the effect of the changes is to show that the husband who did not detect the wife's disguise untill late in the original version discovers it early in the revised version." This resulted in a reclassification from "C" to "B" in the Motion Picture Production Code. Salka Viertel was one of the writers assigned to remake Her Sister From Paris (1928), which had starred Constance Bennet, restoring the original title from the play. "She didn't like the way things were going. There were clashes of temperment on the set, arguments and misunderstandings as well as frequent differences of opinion between producer and director." As interesting as it is, when describing Garbo's frame of mind during the filming John Bainbridge depicts Greta Garbo as having felt dismal, going so far as to again quote unnamed sources that claimed Garbo saw forces at work that desired a demise to her career with two seperate quotes, "'They're trying to kill me' [figuratively: retire her to Sweden]. She often said darkly." and "To her friends, she said,'They've dug my grave.'" The author skirts being too forward. As I have mentioned, it is difficult to ascertain from whom or where John Bainbridge is quoting and it may often seem that his sources are mostly the fan magazines, Photoplay being only one of them, that were widely in circulation during the career of Greta Garbo, despite Bainbridge having published in Life magazine. Writing about the film The Two Faced Woman, Bainbridge quotes Adrain, her longtime dress designer, although Inhabe not as yet come across the quote elsewhere. " 'It was because of Garbo that I left M-G-M,' he said later. ' In her last picture they wanted me to make her a sweater girl, a real American type. 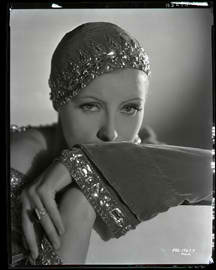 I said, 'When the glamor ends for Garbo, it also ends for me. She has created a type. if you destroy that illusion, you destroy her.' When Garbo walked out of the studio, glamor went with her and so did I.'" John Bainbridge follows his short chapter on The Two Faced Woman with, "For the past fourteen years, Greta Garbo has been the world's most glamorous lady in retirement." Historically, the full page paragraph only augments the effect of the publicity that was circulated during her movie career, when she was deemed The Swedish Sphinx, and the account of her being not only a recluse, but more of a hermit that had abandoned Hollywood, only further lends as sense of mystery, that we are being watched by Greta, who may be lurking around any corner and yet at the same time who was in intimate contact with the deepest, and darkest recesses of immortality. Bainbridge writes, "The tragedy of Garbo, it is now clear, lies in the difference between what she really is and the aesthetic, romantic appeal she made and symbolized." The biographies of Greta Garbo cascade. It is easy to come to the conclusion that Greta Garbo was the most talked about film actress for having a silent film past, no matter how mysterious.They begin from the moment she had first spoken on screen and regularly appeared in fan magazines- of which biographer John Bainbridge was well aware, his having retold her story from them, albiet he conducted very discreet interviews while authoring the volume. The interest in Greta Garboas publicized as interest in her rise to stardom as though each film would be an occaision for an entire retrospect, leaving the reader to ask is Garbo really with us at all. The culmination seemed in 1938 when Modern Screen magazine published fifteen pages of biography, the first of which was a picture of a cover that would suit the reprint of its article in hardcover. It was titled The True Life Story of Greta Garbo by William Stewart. The excerpt included not only biographical data on Greta Garbo the actress, but interpretative material on Greta Garbo the movie star, "When she steps on a set she knows her lines perfectly. No one has ever seen her studying a script. if she rehearses at all, it is for the benefit of the other players and she has never been known to steal a scene. if there is any choice, she will invariably give another player a break." I have previously corresponded with two biographers of Greta Garbo, one having been a particular favorite, Norman Zierold, now a professor of Philosophy who was as evasive as Garbo herself in what amounted in merely a polite exchange of Christmas greetings without touching upon the subject of his early writings on silent film. Zierold is the author of the volume Garbo. Mai Zetterling had said, "I don't have Garbo's austere tragic beauty." If members of her audience do wonder why Greta Garbo disappeared from the screen, for lack of a definitive autobiography written by the actress, Richard Corliss has written, "Two Faced Woman was never meant to be the end of Garbo's career. She didn't think so and neither did M.G.M. There was always intriguing projects being mentioned as her comeback vehicles." Greta Garbo visited James Mason in 1949 while they were planning to film La Duchesse de langeais, an adaptation of the novel Thirteen, written by Balzac. The publication Showman's Trade Review ran an announcement predicting Greta Garbo's return to the screen, "Henry Garson and Walter Robert Soderberg have been engaged by Walter Wagner and Eugene Frenke to write an adaptation of Balzac's Duchesse de Langeais which Wagner and Frenke expect to produce, with Greta Garbo this summer. This would probably replace the biography of George Sand as the picture to mark Miss Garbo's return to film." The magazine followed later with an announcement that the film would be shot in Italy and France, "The Garbo-return vehicle will be titled 'Lover and Friend', will have James Mason as co-star and is to be released by R.K.O." Bainbridge writes that Greta Garbo, after having made screentests, had learned the script, "one postponement followed another, through the producer's finacial difficulties, and at length, through no fault of Garbo's, the project was reluctantly abandoned." During 1949, three cinematographers filmed screentests for the film to be supervised by director Max Olphus. Joseph Valentine passed away shortly after filming 23 minutes of the actress in medium closeup. Less than two weeks later, both James Wong Howe and Greta Garbo Apostle William Daniels both filmed Greta Garbo on the same day, the combined footage feet of similar closeups, perhaps at a closer angle and in more glamorous poses. Among the screentests given to Greta Garbo by William Daniels was a thought to be recently restored nine minute long costume test for the film Queen Christina, filmed in 1933. One would hope that one of the reasons that Greta Garbo had attempted to begin this film was that she had reportedly been interested two years earlier in portraying on screen the novelist George Sand. It is only a passing observation that Bainbridge's biography is presumptuous in being analytic, to where each interviewed account from an aquaintance of Greta Garbo adds to the informality, presented as intimacy of the author's assessments and interpretations, where the source of his historical retelling often is culled from fan magazines already published, the mystery too well known without his directly quoting Garbo from his own interview. Kept on the premise that they had never, or hardly spoken, it can even be out into question whether any of his unnamed sources could have been Garbo herself declining an interview by referring to herself in third person, one example of this having been, "There is enough time for anyone to fulfill the purpose of one's life,' a venerable actress has said, 'But Greta does nothing. She just throws away her days. She always talks about her last picture as her grave, and that is foolish.'" It is unlikely, but still not implausible that the actress quoted is Garbo who would not have consented otherwise, an actress trained by Mauritz Stiller, trained in eliciting mystery, but the biographer's account of her private life become internalized, their versimiltude the extra-textural discourse of an audience member, prying, but coming to his own conclusions- he has reassembled articles in fan magazines and intermittant interviews into, emotionally, what seems to be a personal recollection: stargazing. "She reluctantly gives her name as Miss Harriet Brown, fooling nobody, perhaps not even herself. But her desire to avoid playing the role of Greta Garbo before strangers is overpowering. She has never full understood the part. The character of Garbo, to its creator, is an image that exists only on the screen." Perhaps uncanny, there is a section chronicling Garbo as in retirement at a private screening of he own films where she does in fact comment upon the screen character played by herself by using the third person, written in a way where the biographer would have been in the same theater, evesdropping; more often than not the film being shown would have been filmed on a closed set. Published before Greta Garbo had met with writer-director Ingmar Bergman, Bainbridge chronicles, "Since then she has found no film idea to arouse her lasting enthusiasm, though she has been momentarily tempted" which led to divulging to the reader as if a response that George Cukor had offered Garbo the titular character to an adaptation of the novel My Cousin Rachel, which she read and approved of, "delighted to play the part". After Cukor had spoken with Nunnally Johnson, who was assigned to write the script, Garbo prevaricated, "I'm sorry,' she told Cukor, 'I can't go through with it. I don't have the courage ever to make another picture.'" Three years had passed from what was to be her last screentest. From the other side of the Atlantic, there was a report by Jane Warren of the Daily Express that biographer David Bret has unearthed that Greta Garbo had worked for Alexander Korda, not as an actress on screen, but under Sir William Stephenson (Intrepid) of British Intelligence (MI6). It included her going to Nassau during 1940 and to Paramount Studios on one of her missions and the author goes so far as to infer Bainbridge's account of her whereabouts may have been inaccurate. Bret claims that Greta Garbo in 1942 was interested in filming The Girl From Lenningrad about a resistance fighter during the conflict between Russia and Finland and that M.G.M had quickly announced that Garbo had withdrawn from the film, but that it had only been on the prompting of Korda and Stephenson as she still working for MI6. "She also liasoned on a secret intelligence operation with future United Nations secretary general Dag Hammarskjold, a man who had intimate knowledge of M16 operations in Scandinavia." (Warren) It also outlines a meeting between her and Salvador Dali. In the biography, David Bret goes beyond the review by the Daily Express to add a context with which the events had occurred; he adds that at this time it was thought that Greta Garbo was having an affair with Gilbert Roland, and, although it may have been exaggerated, that there were letters that she had written to him untill 1943, signed "Harriet" or Eleanor",along with a pair of silk pajamas she had given him, that were sold with his estate and that Roland had prepared never published memoirs that had mentioned her. They allude to Garbo publicly having given Roland a cold shoulder and her later that week refusing to see him, her then recapitulating to have dinner with him. Among the traces of celebrity left by Greta Garbo the recluse is a report in Motion Picture Daily during July of 1944, "Regarding the report that Greta Garbo desires to withdraw from the starring role of 'Woman of the Sea', which Lester Cowan will produce at the invitation of the Norwegian Government, the producer states the matter is to be take up with Norwegian officials. Garbo's acceptance of the role was officially announced by Norway's ambassador in the United States." If Greta Garbo was being offered or was considering playing the lead in the film The Fountainhead, which is purely conjecture, she purportedly was advised "as a friend" by director King Vidor to decline- the obvious reason why the modern biographer claiming that the discussion between the two may have occurred seems have hurriedly added an unnecessary footnote is that Vidor was under contract to Warner Brothers. That the air of mystery surrounded her is what should be appropriated, as when after it was reported that an onscreen appearance in Ingmar Bergman's film The Silence might coax her out of retirement, it was later printed that Signor Luchino Visconti was quoted as having said he would have been "very pleased" to have had the "severe and authoritative prescence" of Greta Garbo under his direction when a member of the Rothchild family had mentioned to the press thaOt she was considering the role of the Queen of Naples in Visconti's adaptation of A la Rechere du Temps Perdu, written by Marcel Proust.